Shop for Skincare – Travel Size & Samples from a variety of different brands. All products in this section are Cabin Luggage approved sizes, perfect for that trip away! Greener Beauty is always vegan, always cruelty free, only ever ethical brands and always toxic chemical free. Friendly Soap Travel Bar is a multi-purpose wonder! Richly moisturising and naturally gentle, it has also been specially formulated to be antiseptic, anti-fungal & insect repellent. Introduce yourself or someone you love to luxury, natural and high-performance products from White Rabbit Skincare with The Miniatures Collection. This indulgent set includes all the products in our current range, from hard-working cleansers, to anti-aging moisturisers - and our ever popular Chocolate Orange Lip balm. 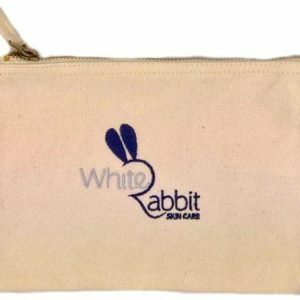 If you'd like to try White Rabbit Skincare but aren't quite ready to commit to full sized products, then these little sample bags are for you! The bags contain four 5ml sample pots, containing our popular moisturisers, see full details for more info. Want to take your White Rabbit Skincare products with you when you are travelling, or perhaps you're looking for an introduction to some of the products in our range?